Livekitchen Restaurant is a clean and modern WordPress theme for Cafe & Restaurant and any food related business web site. Built with the latest WordPress technology. 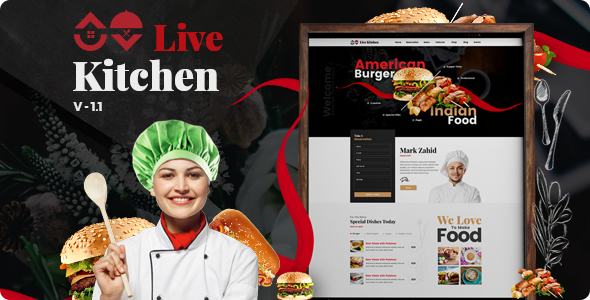 Livekitchen Restaurant theme support responsive layout so it looks great on all devices And also fastest page loading. It has predefined styling for Modern Cuisine Restaurant, Asian Food Restaurant and Elegant Food Restaurant which can be imported with one click. WooCommerce Start your food delivery service quickly with WooCommerce Plugin. We support both online & offline payment options. Direct Purchase link option support for each menu Increase your online selling by offering the link of direct purchase for each menu to your customers. Customers just click the purchase link of each menu they would like to order. Dining Menu Layouts Inspired We provided unique layouts displaying dining menu including classic dining menu inspired which link you can see on actual restaurant. Reservation Options We provided flexible reservations options; for instance, by email form. Awesome 3 Predefined Demos Get your website working in short time with our pre-defined 3 demos. Blog Templates with single blog post layouts are the powerful features to use in different purposes. Post content is flexible to display with images, gallery slider show or with other video source ex. Youtube, Vimeo, and self-hosted video Also, blog post support various content including photo, gallery, video, soundcloud etc. 3 Menu Layouts with 3 menu styles and various customizable options so you can easily create your own menu design. Contact Templates with contact form, google maps & styling so you can easily create contact page. Unyson Page Builder Keynote app-like interface, So anyone can create beautiful page easily. This Content Builder includes lots of features which you can change a lot easily. Easy to Use Keynote-like interface Page builder with keynote app-like interface. Clear overview content inspector. Drag & Drop Page Builder Create your multiple layouts in a single page without touching theme code by dragging and dropping our various pre-defined content modules including gallery, blog, testimonials and etc. Let’s try the powerful built-in builder. Save as Template Page can be saved as template in order to apply to new pages. This saves time to develop new page. Styled Typography in Live Preview Over 600+ Google Fonts are included with all styles and Font changes will be shown in live preview via Customizer. You can change font size, style, color using without touching code. Easily set different typography of Main Content Font Family, Main Content Font Size, H1-H6 Font Family, H1-H6 Font Weight and H1-H6 Font Size. Moreover, simply set dissimilar typography of Menu Font Family, Menu Font Size, Menu Font Weight, Menu Font Spacing and Menu Font Text Transform. Besides, effortlessly change SubMenu Font Size, SubMenu Font Weight, SubMenu Font Spacing, and Menu Font. Amazing Backgrounds Easily applying images, patterns and colors in background, video of your site. Also, various repeat options are available. Simply dissimilar Main Content Background, Background Image, Background Repeat and Background Position. Also, easily change Input and Textarea Background Color and Sharing Button Background Color. Also, easily change Sub Menu Hover State Background Color, Sub Menu Background Color, Top Bar Background Color, and Search Input Background Color. Easily set different background of Footer Background Color, Footer Background Repeat, Footer Background Size, Footer Background Attachment, and Footer Background Position. Furthermore, easily set Footer Background Image by just browsing the image. Simply set Main Content Background Color, Page Content Font Color, Page Content Link Color, Page Content Hover Link Color, Horizontal Line Color and Food Menu Highlight Color. Responsive Design With users behaviour focus, every pages are designed to look great on all devices no matter what devices users are on laptops, tablet or mobile phone. In case, you would like to deactivate responsive feature, only one click is required in your live customizer backend. Easily set different typography of Main Content Font Family and Main Content Font Size. Easily set different background of main background, header background, content background, footer background, page title bar background, Page Content Font Color, Page Content Link Color, Page Content Hover Link Color, H1-H6 Font Color and Horizontal Line Color and etc. Menu Layout Various options to choose your sub menu hover animation; slide, fadeIn, Skew, flipX etc. Sticky Menu Only one click is required for fixed main menu when scrolling. Contact Info Contact Address, Open Hours and Contact Phone Number can be set simply. Only one click is required for enabling search and enabling instant search. Simply change Content Builder Header Line Separator Color by color picker. Only one click is required to set the option to Open Footer Social Icons Link in New Window. Easily change Page Footer Background Color by color picker. Easily change Copyright Background Color by color picker. Easily enter your Copyright Text and also select Copyright Right Area Content (Social Icons, Footer Menu). Easily change Gallery Images Sorting. Easily change Gallery Video Sorting. Easily adjust the page layout for displaying tab for popular and trending post with One click. Only one click is required to enable the display sidebar as post on single post page, and the display related posts on single post page. Menus design your own header with 3 menu styles. Also, rearrange elements of the headers sections, change position of logo, change colors, and apply image, social icons, taglines & secondary top menus. Widgets We provided a variety of custom widgets to make your life easier including Custom Opening Hour, Custom Facebook, Custom Twitter, Custom Recent Post, Custom Popular Posts, Custom Mailchip Newsletter and Custom Twitter. Just drag and drop custom widgets to activate and configure in any sidebars you build. All Page layouts can have left or right sidebar or be full width. Food Menu To display menu to your customers, this theme allow you to specify menu price, menu price currency, highlight this menu, order URL in case of menu online, size options for this menu, and menu categories. Manage and maintain Menu Category (Group of Menu) easily. Testimonial To gain trust from your customer, testimonials are very important. This theme allow you to specify Customer Name, Customer Position in company, Company Name, Company Website URL and Testimonial Category. Manage and maintain Testimonial Category (Group of Testimonial) easily. Team Member To show your team member, this theme supports lots of social profile information such as Position and Role. Manage and maintain Team Category (Group of Team) easily. Custom Styles Custom your styles with custom CSS in theme options. Without changing core theme, no worry for upgrading the theme anymore. Fully Customizable With our flexible framework, theme is the powerful theme to display awesome and various options; full screen image and slide show etc. Not surprisingly, no two versions of theme will ever look the same. Shortcodes Easily create your own custom page with our Shortcodes. Any elements you like in this theme, you can add on your page. Translation Support Theme is included .pot language files. Moreover, theme is compatible with WPML plugin, allowing you to translate your site to any language or multiple languages. Unyson Framework Based in theme. Premium Plugins Included ($25 Value) Revolution plugins are included in theme.